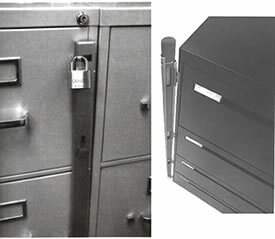 Lock Filing Cabinets! 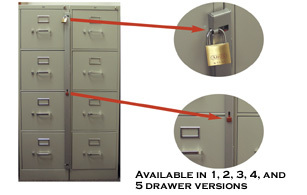 These file cabinet locks keep your important documents from prying eyes! Which File Bar should I choose? To determine which file bar you need, please see the measurements below. You want to be sure the bar will cover at least a portion of every drawer you need to secure. MLK-1c 1 drawer file bar 12"
MLK-2c 2 drawer file bar 22.5"
MLK-3c 3 drawer file bar 34.5"
MLK-4c 4 drawer file bar 46"
MLK-5c 5 drawer file bar 56.75"
Some file cabinets may be non-standard sizes, so we suggest you measure your cabinet from the top drawer to the bottom drawer and choose the bar that will fit within those lengths and cover at least a portion of every drawer. 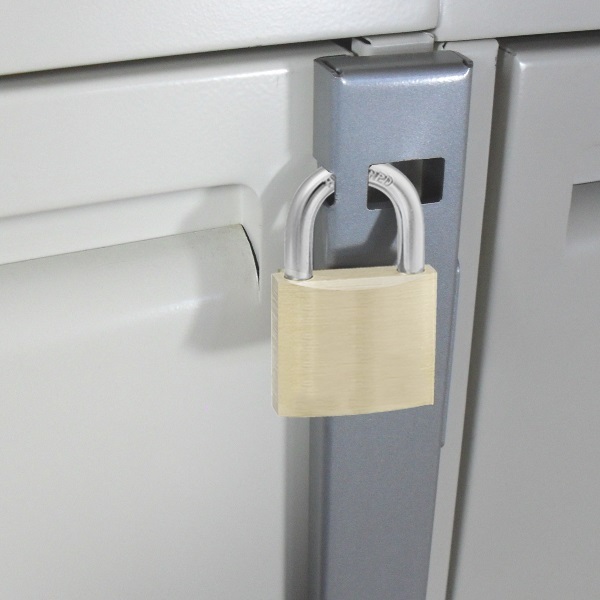 File Cabinet locks are an excellent way to secure your file cabinet contents. HIPAA compliance, company policy and just plain common sense dictate that you lock up important documents. Lock your file cabinet. 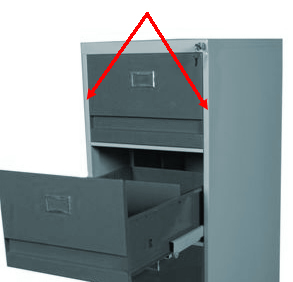 The simple to use, easy to install bar securely fastens to the frame next to the drawers on the front of your file cabinet (minimum 1⁄2" frame required). 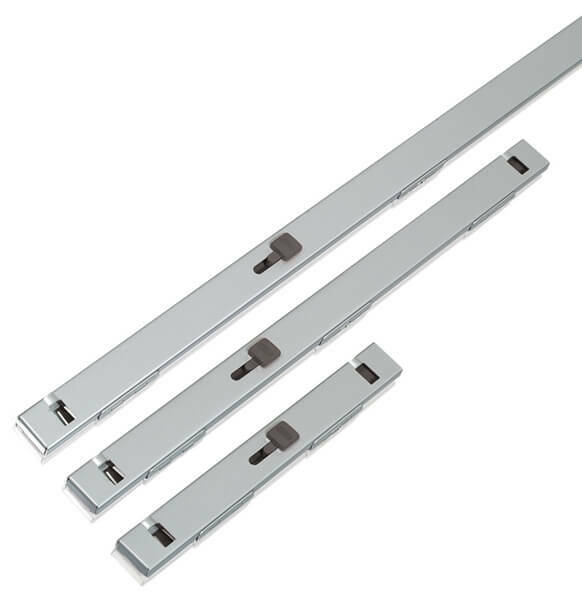 These file cabinet locks can provide a second layer of security to those units with built-in locks or, if your keys are lost, these bars can provide an easy lock replacement system without having to replace the entire cabinet. This File Cabinet Lock Bar requires a padlock. Padlock is NOT included unless you choose a specific padlock when adding the File Cabinet Lock to the cart. You may also order compatible locks in the Accessories section. 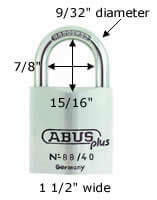 If using your own padlock, it must have a minimum ¼" diameter shackle. The padlocks listed below all work with our File Locking Bars. If you are planning on using your own padlock, we recommend using a padlock with at least a 1⁄4" thick shackle to maintain the security of the bar. 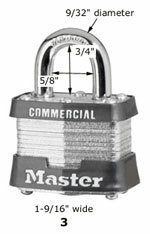 1st-in-padlocks.com carries a large selection of locks from American Lock, Masterlock, and ABUS if none of these padlocks fit your needs. This Diskus padlock has a protected shackle which limits access to it from a bolt cutter or a saw. MLK-1c For a 1 Drawer File Cabinet 12"
MLK-2c For a 2 Drawer File Cabinet 22.5"
MLK-3c For a 3 Drawer File Cabinet 34.5"
MLK-4c For a 4 Drawer File Cabinet 46"
MLK-5c For a 5 Drawer File Cabinet 56.75"
The file locking bar attaches to the small strip of the cabinet that is NEXT TO the drawer, shown in the left picture. It can attach to either the left or right side of the cabinet. You must have 1⁄2" of frame to attach the bar to. Installing these file bars is easier than it looks! View our installation video to see for yourself!